A decadent starter of flavours from the South West region of France. 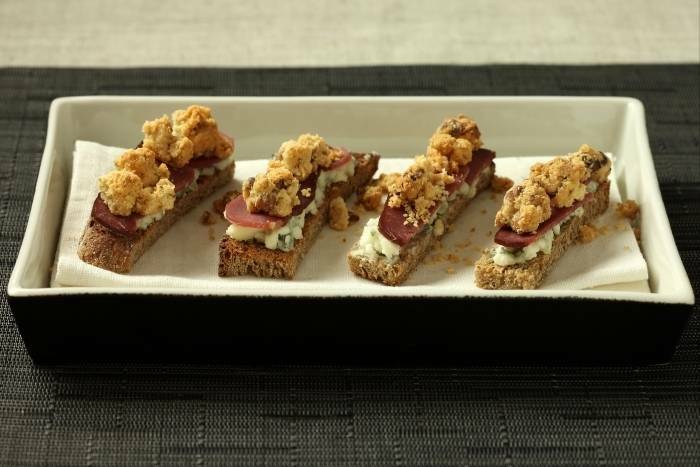 Toasted pain de campagne with roquefort, smoked duck breast and a crisp nut crumble topping. Place the flour, butter, ground almond and the crushed walnuts in a bowl and rub together with the tips of your fingers to make a crumble. Spread the crumble mix on to a silicone baking sheet. Transfer to the oven and cook for 15 minutes. Grill the pain de campagne on both sides. Place thin slices of roquefort on to the toasted bread and then top with the sliced smoked duck breast. Cut in to 'soldier' sized slices. Sprinkle the crumble over the 'soldiers' and finish with a few sprigs of chervil.